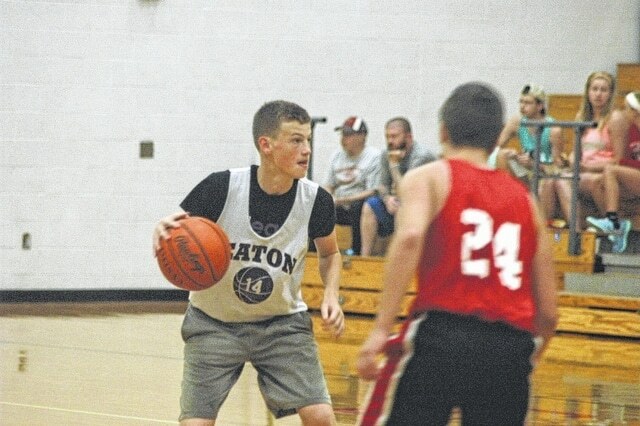 The Eaton Eagles varsity Basketball team battled Twin Valley South and Carlisle during summer league play on Wednesday, July 1, at Twin Valley South High School. The Eagles won two games during summer league play despite not having a varsity head coach. EATON — After having 27 applicants and nine interviews, Eaton Community School officials continues to search for a new head basketball coach for the high school. The search began after the Eagles parted ways with last year’s coach Denny Sheppard after the Eagles struggled on the court the past several seasons. According to Eaton Athletic Director Eric Silverman, the Eagles have a search committee which is searching for a coach to lead the program both on and off the court. “Our search committee is looking for a dynamic leader who understands the value and purpose of education based athletics. We’re looking for someone with a strong basketball background who will help our athletes become better basketball players while providing them the necessary leadership to assist them in becoming strong members of our community after graduation,” Silverman said. Silverman continued by saying they are being open minded and said previous varsity basketball experience is preferred but not an absolute. Silverman did not give a deadline — but said they do feel a sense of urgency so the coach can come in and prepare for the upcoming season. He continued by saying that all hiring processes are different but it’s important the right coach is hired not that the position is filled quickly. “All hiring processes are different and at the end of the process we want to make sure we have the right person in place to lead our student-athletes. Some processes take longer than others, but it is the end result that I’m most focused on,” Silverman said. For now, according to Silverman, the Eagles will go through their summer basketball under the leadership of Randy McKinney. McKinney is a familiar face for the program as he was the Junior Varsity coach a season ago and has led the team’s basketball camp, open gyms and is currently coaching in the Twin Valley South summer league. The Eagles finished with two wins and four losses during summer league play.